Larry Jones, CEO of Richard Allen Preparatory Charter School, speaks in support of charter schools to city council members and pro-charter school advocates in January. 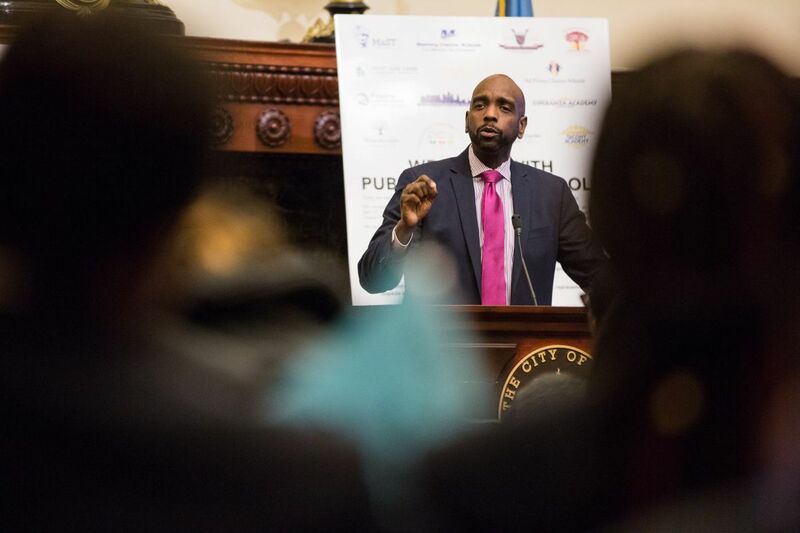 Charter school administrators, parents, students, and council members convened to discuss the need for equal representation on the board of the Philadelphia School District, as well as public support from elected officials. The Philadelphia School Board is transitioning back to local control and the nomination of school board members marks a major turning point. So does Mayor Kenney's audacious plan, released last week, to raise taxes to fund the schools. But the simple fact is that the school district will continue to suffer from the outdated, terribly flawed charter school law. Until that law is drastically revised, it will be difficult for the School Board to control its costs. The 20-year-old Pennsylvania charter school law has outlived its purpose and the mistakes made in crafting the law are being worsened by the dramatic rise in charter school enrollment. Funds are distributed not according to need but on the basis of formulas that bear little resemblance to actual costs. Getting a handle on the way charter schools spend their money is almost impossible. There is little detailed data published and charter school fiscal transparency is nonexistent. While charters must provide some information publicly, it is sparse and affords limited ability to compare charter spending with public school outlays. Want to know the teacher salary structure or the amount the managers or owners of the charter schools make? Good luck. That contrasts with public schools, which provide specific details. Thankfully, in 2014, the Philadelphia Controller's Office did a detailed analysis of the way Philadelphia charter school funds are distributed and used. That report, "The Impact of Charter Schools on the Finances of the School District of Philadelphia," is worth reading. Charter school funding may be based on the cost structure of traditional public schools, but charters spend differently. As the report noted: "Charters spend, on average, 38 percent less on instruction and support than the traditional public schools, on a per student basis." So, what's the problem with that? Simple. The tuition stipend paid charters is heavily dependent on what school districts pay their instructional and support staff. That creates a conundrum for public schools. Any pay raise they negotiate turns into higher charter school tuition stipends — even if the charters don't spend the money in the classroom. Instead of putting their money into salaries, "Charters spend more than twice as much on administrative services than the traditional public schools, on a per student basis." That raises a simple question: Are charters really more efficient? Doesn't look that way. But where things really go off the rails is when it comes to special education. The report found that "In 2013, traditional public schools spent an average of $11,954 to educate each special-education student; the charter sector spent $7,891. Yet, the charter sector received a special-education supplement of $11,564 per student. In other words, the charter sector received about $3,600 more per special education student than it spent on special education instruction." This gap was created because the law requires the use of average cost, not actual cost for special-education reimbursement. Few charter schools are equipped to meet the massive needs of the most challenged students, whose costs can exceed $100,000 for a single student. Not surprisingly, most of those students enroll in the traditional public school system. In contrast, charter school special-education enrollments tend toward the low-need/lower-cost segment. What results is a special-education stipend that is over 40 percent higher than the base tuition stipend. That has effectively, if not inadvertently, made special-education students "cash-cows" for charter schools. The special-education reimbursement formula costs the Philadelphia School District tens of millions of dollars each year. If the charter law were reformed, the city would not have to dig so deep to raise taxes. Reduced spending on instruction and support, significantly higher spending on administrative services, the ability to run a profit on special education and the massive draining of funds from the Philadelphia School District's coffers all might be excused if charter schools improved educational outcomes. Alas, that does not appear to be the case. It has yet to be shown that charter schools in Philadelphia outperform traditional schools. A recent study by Public Citizens for Children and Youth indicated that statewide, traditional public schools have actually outperformed charter schools. There are many truly wonderful charter schools. Unfortunately, the charter school legislation was not written to allow for funding fairness, financial transparency, or a way to determine what works best either educationally or financially. The state legislature need to totally revamp the Pennsylvania Charter School Law. Jeff Hornstein, project manager on the Controller's study and now the executive director of the Economy League of Greater Philadelphia, said it best: "Many who have studied Pennsylvania's system know we need a strong and transparent system for overseeing and evaluating charters. Pa.'s current charter law is far from a 'best practices' standard."